The Mongolian National Museum was first established in 1924 with the aim of introducing the history, culture, and natural environment of Mongolia to its visitors. From 1940 to 1941, the museum was known as the Museum of Local Research and then from 1956 to 1991 as the State central Museum. The State Central Museum moved into its own building in 1956, with galleries for history, natural environment, paleontology, and Mongolian art. In 1964, the History Gallery was enriched by new exhibits of ethnography. 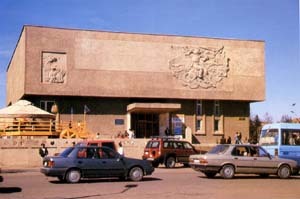 In May 1991, the State Committee of Culture and Art decided to improve the museums throughout the country and it established the National Museum of Mongolian History by merging the historical collections from the State Central Museum with the Museum of the Revolution, which had been founded in 1971. The National Museum of Mongolian History is now located in the facility built for the Museum of the Revolution. The Memorial Museum of the Victims of Political Repression (also in Ulaanbaatar) is a branch museum of the National Museum of Mongolian History. The National Museum of Mongolian History is a cultural, scientific, and educational organization that presents Mongolian history and culture from the dawn of humanity to the present day. The museum has been implementing different projects related to museum research work in cooperation with foreign and domestic museums as well as scientific organizations. In the last ten years, it has organized exhibitions in Germany, Japan, the U.S.A., Korea, Italy, Norway, China, and the Netherlands.